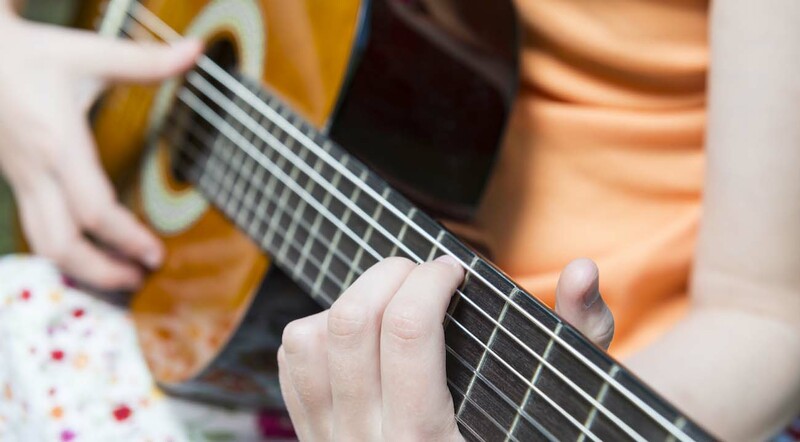 The first few months of playing are the most crucial for a child learning guitar, so it's imperative that you choose a beginner guitar to suit them. If they make it through the first 3 months, then they are much more likely to become a life-long player. 1. 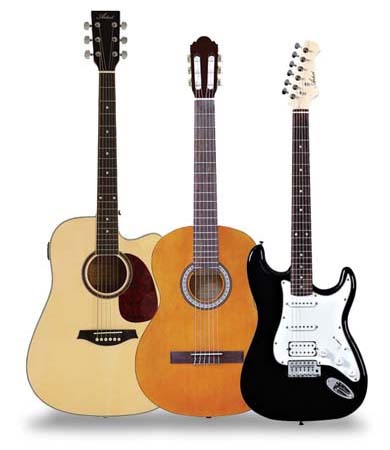 Find the right guitar to suit their musical preference. 2. Find the right sized guitar that will be comfortable to play. 1. Acoustic, Classical or Electric? In most cases the best place to start is on a classical guitar and there is a very good reason for this. A classical guitar has nylon strings which are gentle on the fingers, compared with the steel strings of an acoustic or electric guitar. However, if your child enjoys listening to rock or pop music, then they will be more likely to be inspired to play the guitar that sounds like the music they listen to. Acoustic guitars are similar in shape to a classical guitar but come with steel strings. This gives the acoustic guitar a much brighter and louder sound. The downside being that the steel strings can be quite sharp, especially to young fingers. We normally recommend children start off with a classical guitar until their fingertips have hardened a little. Electric guitars are much smaller than steel-string acoustic guitars and classical guitars so a younger or shorter person can comfortably play. Something to consider, though, is the weight. Some electric guitars can weigh 5 - 6 Kilograms which can be difficult for younger children to handle. If you think your child would be well suited to the electric guitar, we recommend starting out on the STH style, which is our lightest and easiest to play. We would normally recommend children be at least 13 years before they try an Electric Guitar, because of the extra weight and the sharp steel strings. Every child is different and some children may be capable at a younger age. So if you consider your child quite strong for their age, then, by all means go for an electric. We carry a broad range of sizes in our entry-level range. The correct size is most accurately determined by the player’s height, age and in some cases gender. If you can tell us these three details we can give you a personal recommendation. 2. What Size Should You Buy? Can be heavy, depending on the model. Good for classical, flamenco, Spanish music. Available in the smallest size – 1/4 size. * A full-size classical guitar has a wider neck than other guitars. If your child has small hands we recommend the CL44S slim neck classical guitar.